While the app is on its way to become the leader in Twitter apps for BlackBerry devices there are still two features that I mentioned in my last post that need improvement. The first is the retweet feature. Most people like to have the option to edit a tweet before they retweet it to their followers. Not allowing a person to edit a tweet could cause people to not want to retweet or perhaps not want to use the app if they retweet a lot. The second feature that needs improvement, yet not as important, is the choice to choose from different photo services. TwitPic might be the first Twitter photo service to arrive on the scene, but there are several other photo services out there such as TweetPhoto, TwitGoo, as well as many others that are gaining popularity. Therefore, allowing the user to choose between photo services is something RIM should consider before they release the official Twitter for BlackBerry® app. 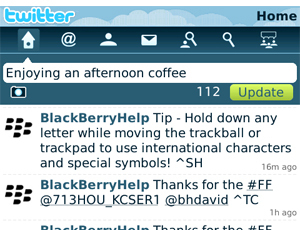 Update: The official Twitter for BlackBerry® app is now available to the public. You can download the app at blackberry.com/twitter.